How often do you go to the cinema and the audience is in complete unison in laughter at a truly awful film? After being given an ancient Chinese wishing box from her father, Clare (Joey King) now possesses seven wishes to do as she pleases with. Unsure of its power, Clare starts to make wishes and slowly uses the box to better her own life. Once her wishes come true, a life is taken in return as close ones around her start to be killed off. 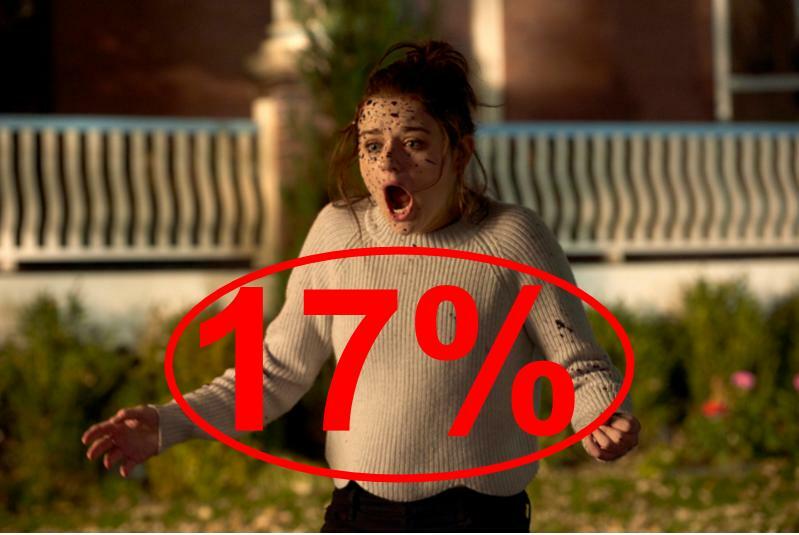 'Wish Upon' joins 'The Bye Bye Man' in competition for the most unintentionally funny horror movie of the year as this shameful movie fails on all levels. As far as horror goes, you may not find a more poorly executed film in the genre in recent times. The film starts off with a short backstory about this wishing box before jumping forward to Clare being in high school. Less than 5 minutes into the film and you can already tell what kind of an experience this will be. We are introduced to a cringy high school environment where an incredibly cartoony bully starts to pick on Clare. Shortly after, the two end up in an incredibly embarrassing catfight which is quite hard to believe actually happened. This is really not helped by the over acting and terrible script that is only a taster of what is to come. In horror films, it is absolutely essential to try and evoke feelings of fear and terror into the audience through its settings, atmosphere, and events. For the most part, horrors do succeed at creating a creepy atmosphere even if all else fails. This is usually ruined by an abrupt jump scare but some form of tension has been created. With 'Wish Upon', there is absolutely nothing remotely scary or tense at all. This is probably the least scary horror film I have ever seen as there is a complete failure in build up and execution of scares. The film is rated 15 in the U.K. and perhaps without the use of suicide, this probably could've made the 12A rating. The audience doesn't actually get to see the deaths that happen as quick cuts are used to signal that something is actually happening. Before you see what finally happens to kill off a victim, there will be many cuts as the camera zooms out on an image of a limp body next to their cause of death. This is indeed before we get some of the most unintentionally hilarious moments of the film. The deaths themselves happen in such predictable and overly dramatic ways that are just hard not to laugh at. The bath tub scene, in particular, is a highlight for this very reason as it takes itself seriously but the events are truly comical. What really doesn't help is that the film really lacks any good, interesting or compelling characters. There isn't really much of a reason to like the main character Clare as she is a grumpy teen and she becomes more unbearable as the film goes on. Her motivations aren't very clear and her morals are very questionable as the story progresses as she suddenly becomes so attached to the box. It is not made clear why Clare is suddenly unable to live without the box but hey, the film opted out of trying to be scary so why would it bother putting effort into its characters? The rest of the cast is made up of completely disposable characters who are incredibly generic and bland. Take for instance the uncle of Clare is introduced only to shortly be killed off. Using family members in this event is a good way to bring out emotion as you see a bond between the two and feel some sort of sympathy for the character. But with this film, it just skips over building any form of relationship that may make you care about them. Due to this, when the deaths happen, it doesn't have any effect on you. It's hard to tell whether it is the actor's fault or if it is due to the director. There seems to be an incredible lack of reaction to these events from the main characters despite what is happening. When you see your own friends be killed right in front of you, you'd think that the characters would be an emotional wreck. But in this film, they don't seem to be too moved or traumatised at the time of the event. Joey King isn't a bad actress and has shown her capabilities in 'The Conjuring' and 'Going In Style' so I'd tend to look at the poor direction to be the reason why. Everything just doesn't seem natural at all as everybody acts so weird at all times. Again, the weak script is largely to blame for this. As if the laziness couldn't get worse, the score is basically none existent. In fact, it is mainly made up of current pop songs that don't help create a tense or creepy feeling at all. Even the simple addition of some orchestrated music would've helped these situations and you could at least appreciate that aspect for what it was. Instead. its pop songs and stock sound effects. On the topic of using stock, there is an overhead shot in which we get to see the city where this is located. The problem is, this footage is not in focus and is not at the same quality of picture as the rest of the film. This looks terrible and is very noticeable and only highlights the lack of effort that went into this film. This was embarrassing to see in a feature film with a $12 million budget and only seemed to highlight that there wasn't much care or effort in this project. And that's the worst thing about the film. It thinks it can get by with its premise, simply being a horror and because it has a young up and coming star in it. The film knows people will go and see it so there wasn't a need to try. That makes this not only a truly terrible film but an insulting one as well. This deserves to be in worst of the year lists as it fails on all level. A truly awful horror that should be avoided like the plague. So have you seen 'Wish Upon'? If so, what did you think of this movie? I hope that this review was useful for if you were planning on seeing the film or not. Once again, thank you for taking the time to read my review, it is much appreciated!